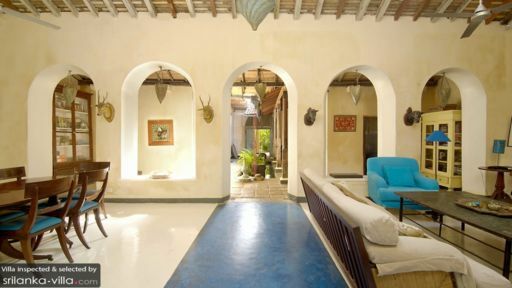 Found inside the walls of the historical Galle Fort in Sri Lanka’s Southwest coast, Villa N79 or 79 Leyn Baan is a beautiful rustic property in the middle of a historical site. The stunning beach view from the terrace where you can spot the endless ocean with its sparkling water and the horizon, is another great advantage at staying at this homey retreat. The three-bedroom holiday home is done up in pastel paint weathered to make it look old-style and artistic. The green and yellow colour palette compliments the outdoors splendidly well as the natural abundance of the gardens and the blue of the ocean comes through with the colours. The three bedrooms at Villa N79 feature a varied colour scheme from green to blue to pastel yellow for a vibrant, tropical vibe. The master bedroom is furnished with a king-sized bed, the second with a queen-sized bed, and the third bedroom is furnished with a bunk bed. All bedrooms are comfortable, homely, and offer all necessary amenities to guests. 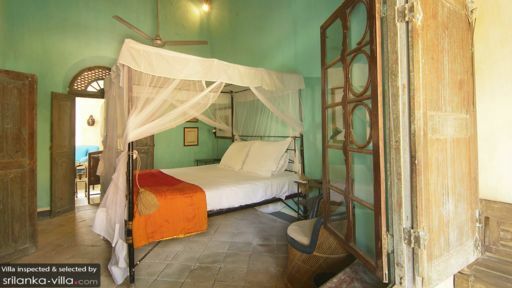 The bedrooms are decorated with artefacts and items that have been collected from several places to make for a well-travelled home. The last bedroom has a large desk, ideal for writing, reading, or working. There are en-suite bathrooms for each bedroom as well, fitted with either bathtubs or showers. There are ample sitting areas in the villa with armchairs, sofas, stools etc. for lounging with a good book in hand as there are bookshelves complete with a vast collection of titles for you to choose from. Villa N79 is a paradise for the quiet traveller as there are no disturbances and you can do your own thing without a worry. There are arches that look out to the corridor with the ponds so you can enjoy a peaceful view while you rest. For décor, the living area features iron animal busts on the walls for a rich, tropical touch to the area. The dining area is found beside the seating in the living area and features a wooden dining table for six people for a nice, relaxing meal with friends and family. There are more dining options out in the veranda with a rustic dining table as well as a picnic-style dining area for guests to choose from. The kitchen is fully-equipped and features many pictures from around the region, past guests, and selective artwork. The villa staff offers its services to guests with regular housekeeping and security to keep you safe and without a worry. There are many special services that can be arranged, such as, laundry or in-house massages, at an additional charge. The staff is happy to recommend local sights and places to visit as well! 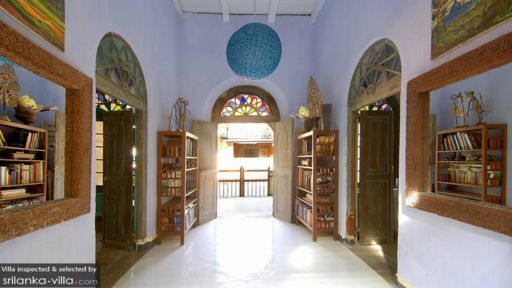 The villa is in an ideal location in the fort walls, so you can visit the historical town of Galle without a hassle and explore the stunning colonial, Dutch-inspired architecture with buildings that retain the past to this day. The beautiful place is best explored on foot and you can even enjoy some drinks at popular bars like Pilgrims Lounge and The Living Room. The house is close to the Mosque so light sleepers should bring ear plugs... although the call to prayer is approx only 45 seconds. There is a house pet Daschund who is people/child friendly but will bark at everyone when they walk in - every time. Due to the inner courtyard pond this is NOT for families with crawling babies/toddlers. This is in the Fort so a house in a populated town. Housekeeper comes daily and will clean and help with breakfast but otherwise this should be considered self catering.